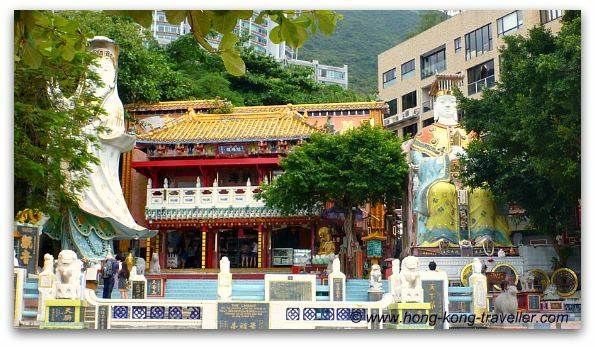 The attraction of Repulse Bay beach to tourists and visitors is not only about the sandy haven away from the city, but also the colorful collection of mosaic deities, statues, shrines and pavillions in the south-east end of the bay. 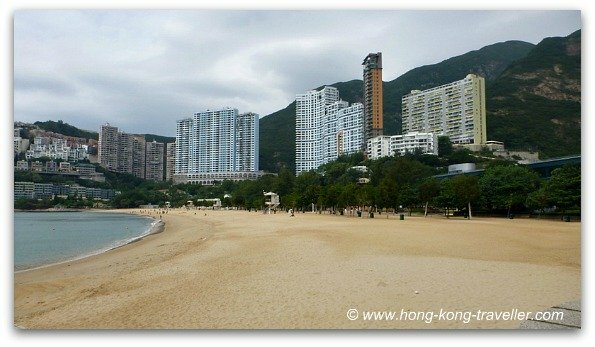 Repulse Bay is just a short bus ride from the hustle and bustle of the Central District. 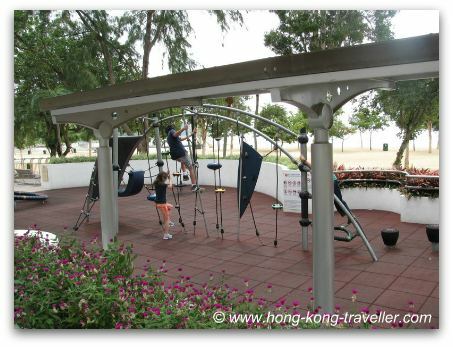 Located in a spectacular sheltered bay framed by the mountains overgrown with high end condominiums and townhomes, it is Hong Kong Island's popular weekend retreat specially in the warm summer months. 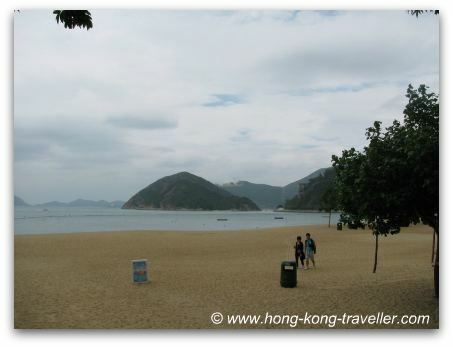 What used to be a Pirate refuge later "repulsed" by the British, hence its name, Repulse Bay is nowadays a very popular beach town, there are convenient shower and changing facilities if you want to go for a dip. 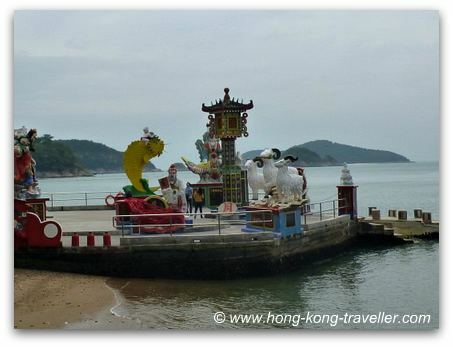 But even if the beach scene is not enough of an attraction, a quick stroll through the half-moon shaped bay to check out this very peculiar and colorful shrine, just at the southern end is worth a look. 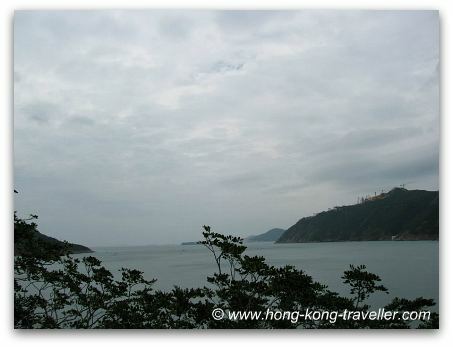 Overlooking the sea as if standing guard, are two of Hong Kong's beloved deities, Kwun Yam and Tin Hau. 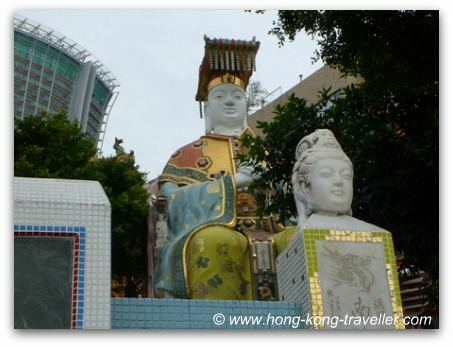 The towering traditional Chinese statues stand 10 meters high in sharp contrast to the ultra-modern high-rise skyline. Kwun Yam, Goddess of Mercy, is the comforter and listens to those in distress, the sick and the frightened. This is the compassionate Goddess that inspires love and devotion. Once you arrive, it is a very pleasant stroll through the beach, there's lots of greenery, a play area for kids, concessions and facilities, toilets, etc. 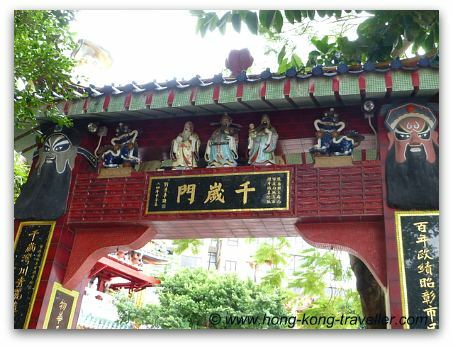 There is a walking promenade that leads to the colorful shrine. You will first see the entrance of the shrine and a bright red bridge and a Chinese style pavillion over the water, this is the Longevity Bridge which you must cross to add three days to your life so don't miss it! 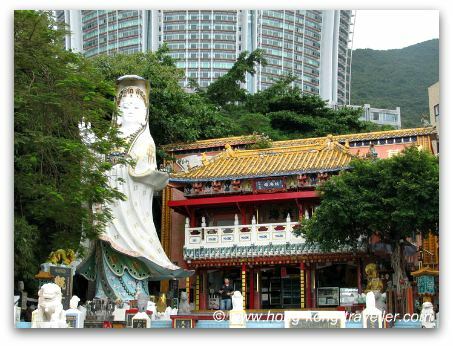 The standing statue is that of Kwun Yam, the Goddess of Mercy, to whom the shrine is dedicated. The "Gold" Gods and Money Gods are very popular, and you might see lines of people waiting to rub their bellies to catch some of their good fortune. The Love Gods are equally popular amongst the youngsters. 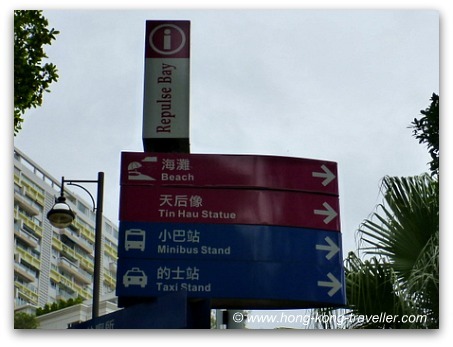 Getting to Repulse Bay Beach is easy with Buses 6, 6A, 6X or 260 from Exchange Square. 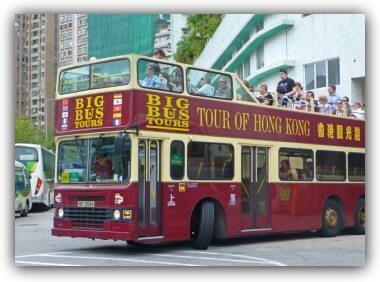 These are the same buses that bring you to Stanley, and in fact, a visit can be combined. Take the Hong Kong Station MTR Exit D to get to Exchange Square Bus Terminal. 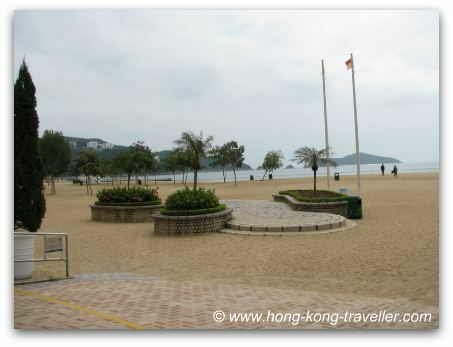 The buses will bring you to the Repulse Bay stop, from there cross the street (head towards the beach) and go down the stairs to follow the promenade. 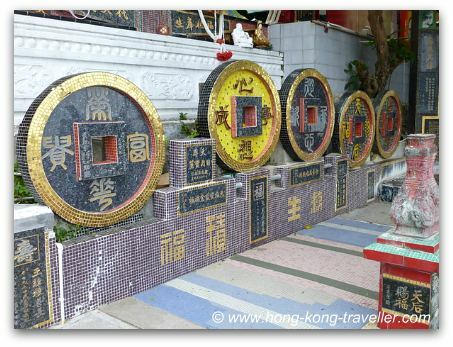 If you are going to the Kwun Yam Shrine in the south-east side of the bay, there are many signs pointing you in the right direction, (if you are facing the water, head left). 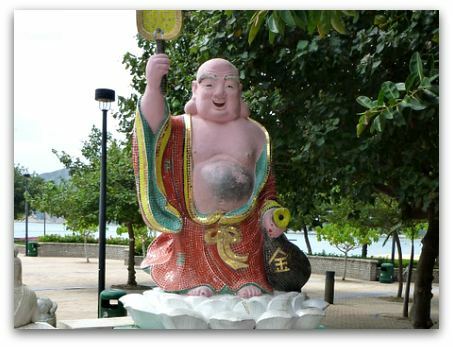 Just follow the signs to the "Tin Hau Statue". Remember you can use your Octopus Card to pay the fare. Sit in the upper deck, the vistas as you approach the coast are very nice. The bus will take approximately 35-40 minutes from Central, then it's an extra 20 minutes if you are going to Stanley. 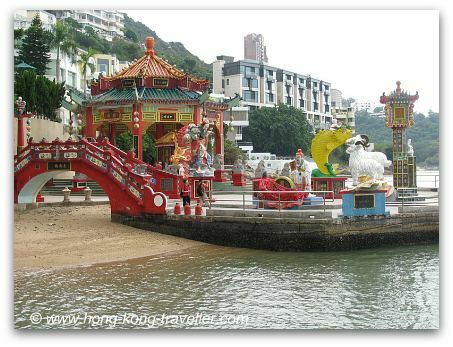 Many of the city tours offered by operators make a stop here at Repulse Bay. 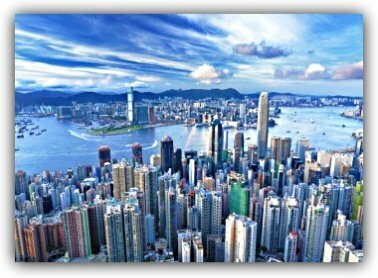 This Hong Kong Island Half-Day Tour, which at about US$35 per person (Kids $28) is great value and covers a lot of the highlights, it is a great introduction for first-timers. 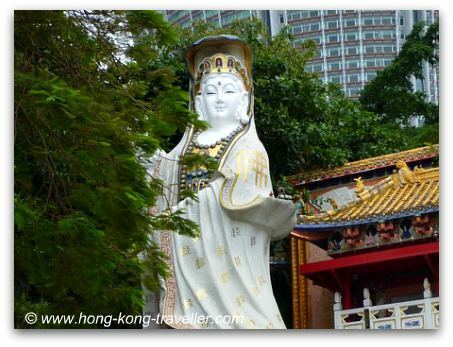 This comprehensive half-day tour is a great way to get to know Hong Kong Island and its famous landmarks and history. 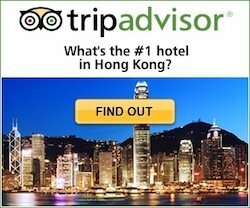 The tour lasts approximately 5 hours with pick up points at several Hong Kong and Kowloon hotels. The Hop-On-Hop-Off Bus in Hong Kong is a great way to get oriented, specially for first time travellers. 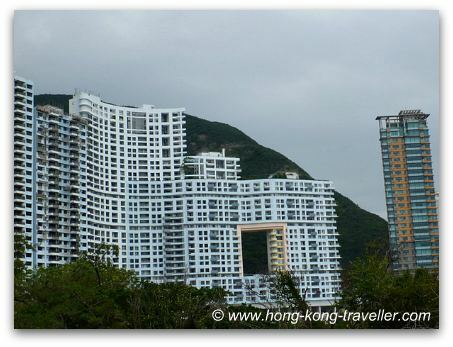 There are three loops that cover all the must sights in the city including a stop at Repulse Bay. 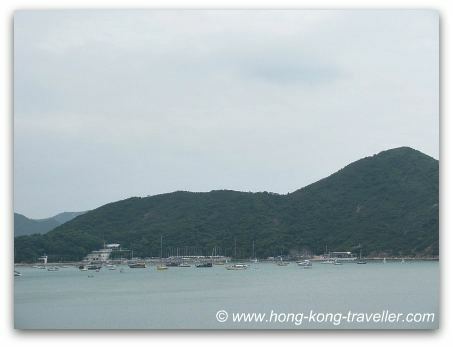 You have to take the Green Route which connects at the Central Star Ferry Pier and services Aberdeen, Repulse Bay and Stanley. 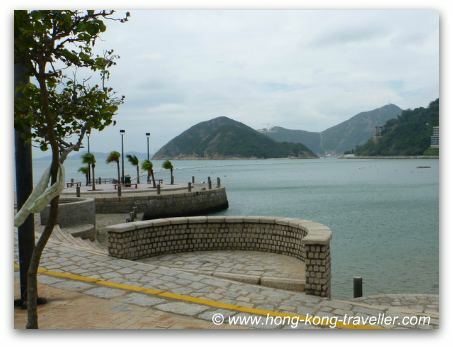 After your visit to Repulse Bay why not continue heading south? The Hop-On-Hop-Off Bus will also take you to Stanley, or if you are on your way back, to Aberdeen Fishing Village.